Brunei Malay is the name used to refer to several very closely related and assimilated groups of indigenous people in Brunei. The largest are the Malay and the Kedayan. Several smaller groups, including the Low Malay Creole, Kiput, Kayan, and Southern Bisaya are also a part of the Brunei Malay population. Although they are ethnically related to the Malay and also share the same Islamic religion, there are many cultural and linguistic differences that make the Brunei Malay distinct from the larger Malay populations in nearby Malaysia and Singapore. The majority of Brunei Malay live in the capital city called the Brunei-Muara District, and also on the coastal strip spread along the sea border of the country. They write in Bahasa Malaysia but they speak in Brunei Malay, which is uniquely different in sound from spoken Malay. The culture and customs of the various groups are often quite different - for instance, they differ from group to group in the adat (the unwritten village law) which regulates behavior in the individual villages. As the indigenous people of the land, the Brunei Malay generally enjoy special privileges that are tied to the prosperity of the country - the Islamic Sultanate controls extensive petroleum and natural gas reserves. They are much favored in areas such as government employment and access to the national universities. They enjoy medical and educational services that are relatively well developed. Revenues from petroleum production largely finance these services which are provided free of charge to the Brunei Malay. The Sultan of Brunei Darussalam also subsidizes their food and housing. 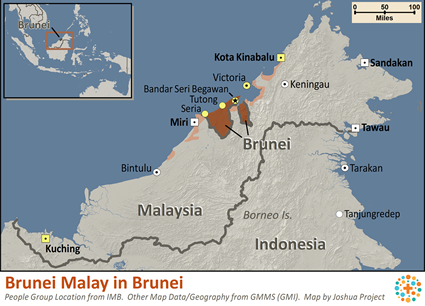 All Brunei Malay are classified as Muslims at birth; they are exclusively Shafi Sunnis Muslims. The Brunei Malay people adhere to traditional Islamic practices and beliefs. It is estimated that Brunei has more mosques per square kilometer than any other country in the world. Their religion is based on the five pillars of Islamic faith. They affirm there is no god but Allah, and Mohammed is his prophet. They are required to pray five times a day, give alms to the poor, fast during the month of Ramadan, and try to make at least one pilgrimage to the holy city of Mecca. 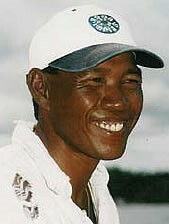 Many of the Brunei Malay groups characterize their entire people group as being Muslim. This classification, however, is more of a cultural distinction than a characterization of individual beliefs. Individual beliefs will often be influenced by tribal religions of their ancestors. Currently, the Brunei Malay groups are physically well taken care of. Their country is rich in oil and petroleum and the Sultan is very generous. But material resources can run dry. Although the Brunei Malay have many material resources, there remains a need for spiritual fulfillment. Pray that laborers will be sent forth who will go and work among the Brunei Malay. View Brunei Malay in all countries.